“Cannabis legend Ruth Whitefeather Feldman employs her newly graduated son and a team of young “budtenders” to help run her Los Angeles marijuana dispensary. Disjointed is a workplace comedy from Emmy winning creators Chuck Lorre and David Javerbaum. 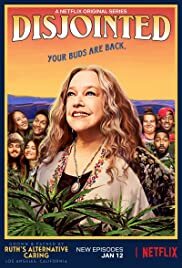 Academy Award winner Kathy Bates plays Ruth, a lifelong advocate for legalization who is finally living her dream as the owner of an Los Angeles cannabis dispensary, Ruth’s Alternative Caring.